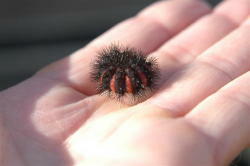 Size: Adult--2 1/4", larva--1 1/2"
Identification: Black, very fuzzy caterpillar. Red-brown band in the center on the body. Hairs are short, stiff, and bristly. Orange stripe. If more than one stripe, a cold winter is supposedly on its way. Commonly seen crossing roads in the spring and fall. They curl into a ball when disturbed. Adults are white or yellowish moths. Biology and Life Cycle: Adult is the Isabella tiger moth. Caterpillars hibernate and spin a hairy cocoon in the spring. Adults emerge from the cocoon to lay eggs. The larvae hatch and undergo six molts, crawl around awhile, find a protected place to pupate, turn into adults that then lay eggs, which hatch into larvae that actively crawl around looking for a place to overwinter. Two generations a year. Complete metamorphosis. Habitat: Dandelion, plantain, and low-growing weeds and grasses. Meadows, pastures, uncultivated fields, road edges, and urban landscapes. Feeding Habits: Feed on low-growing herbaceous plants of many kinds, mostly wild. Will sometimes but rarely attack ornamentals and food crops. Economic Importance: Little that we know of. Natural Control: Parasitic wasps, birds, and flies. Insight: Folklore says that the more red bands, the longer the winter will be.